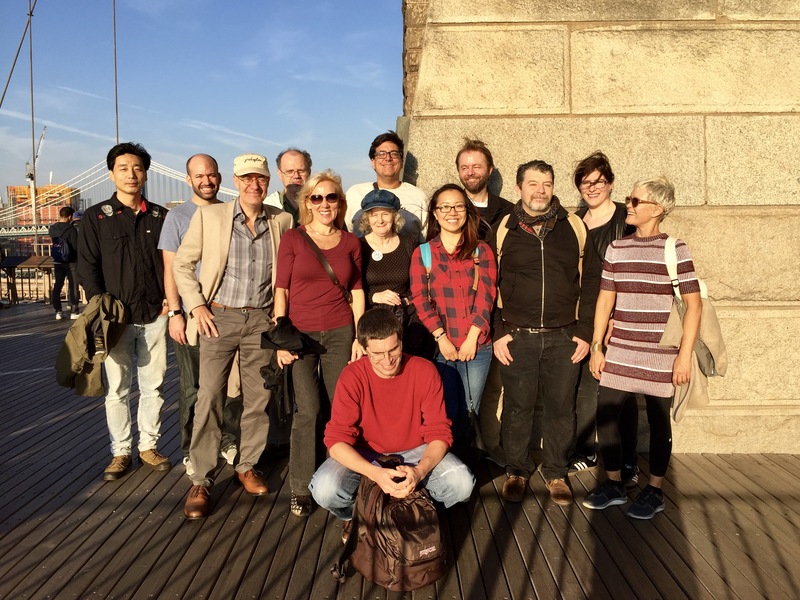 STOICON ’16 just ended in New York City, and according to one of our speakers, Bill Irvine, it was the largest gathering of Stoics, ever: 331 attendees. It was, more importantly, an amazing opportunity to meet and mingle with people from different parts of the world who are interested in, or regularly practice, Stoicism as a philosophy of life. All the talks, and one of the workshops, will soon be available as video on YouTube (stay tuned for announcements! ), but let me give you a flavor of what happened this past Saturday in the Big Apple, just to whet your appetite. The first speaker of the day was Don Robertson, with his inimitable Scottish accent. Don, who is the author of the very first book on modern Stoicism that I read — Stoicism and the Art of Happiness — talked about the connection among Stoicism, mindfulness, and Cognitive Behavioral Therapy (he is a licensed practitioner of the latter). He pointed out that Stoic mindfulness is different from techniques aiming at emptying your mind of wandering thoughts, for instance, as it is done in some strands of Buddhism. The Stoics meant it as a cognitive exercise to constantly remind themselves to live by focusing in the here and now (hic et nunc), as well as by paying attention to the ethical dimension of everything they do (though both of these concepts are also found in Buddhism). Julia Annas, one of the foremost scholars in ancient philosophy and author of Intelligent Virtue, rhetorically asked the audience if Stoic virtue is as off-putting as it seems, proceeding to regale us with an in-depth analysis of apparent paradoxical concepts, such as that we are all equally unvirtuous, and yet we can make progress (see the “drowning man metaphor“); or that the Sage is like the mythical phoenix, i.e., a state that can never be achieved by actual human beings. But if so, then why bother trying? My own take on these questions is that the Sage is an ideal, and it doesn’t matter if any such man or woman ever existed, it is simply something to strive for. As for the apparent paradox that we can make progress (we are all prokoptontes) and yet we all equally lack virtue, I take it to be the Stoic way to remind us to be humble, that the job is really never finished, it continues to the end of our lives. After coffee we had a special treat: a video conference with Larry Becker, author of the scholarly and highly influential A New Stoicism (new edition coming out soon, by the way). Despite some technical difficulties with the audio, we chatted about Posidonius, the Stoic teacher of the middle Stoa who was known for being a dissenter about a number of Stoic doctrines. Larry reminded us, therefore, that the Stoics themselves held different opinions about a number of issues, and that it is a mistake to treat Stoicism as a monolithic block of ideas that were put in place and never changed. There was no Stoic Moses coming down from Mount Sinai with the tables of the Ten Commandments, so to speak. Rather, Stoicism is an evolving philosophy, open to improvement and refinement, as human knowledge and understanding of the world progress over time. Following that, Debbie Joffe Ellis, wife of the late Albert Ellis, the founder of rational emotive behavior therapy, talked about not just Ellis’ work, but his ethical life as well. REBT is strongly influenced by Stoicism (just like Viktor Frankl’s logotherapy, and CBT more generally), and we kept being reminded of the many similarities between the two throughout the talk. In a sense, REBT (and logotherapy and CBT) provide substantial empirical evidence that the Stoics got a lot of human psychology right, with modified versions of several of their techniques being still useful to people two millennia later. Debbie is the author of How to Hug a Porcupine: Easy Ways to Love the Difficult People in Your Life. Chris Gill, who wrote Naturalistic Psychology in Galen and Stoicism, asked whether a Stoic can be a political activist, and answered in the affirmative. He dispelled the myth that Stoics were indifferent or removed from social and political action (that was the Epicureans, by the way). On the contrary, the Stoic concept of cosmopolitanism, the fact that one of the cardinal virtues is that of justice, and the very lives of many of the Stoics we know of, clearly show that there is no incompatibility between Stoicism and an active concern for the polis. Cinzia Arruzza, author of Dangerous Liaisons: the Marriages and Divorces of Marxism and Feminism, gave a very different talk, on French philosopher Michel Foucault’s take on the Stoics. She related how she was initially rather skeptical of the Stoic take on things, but that Foucault made her appreciate the Stoic emphasis on agency and personal change in the face of society’s injustices. Who knew that a post-modernist philosopher like Foucault could have anything in common with Seneca, Epictetus and Marcus? Unfortunately, I couldn’t go to any of these, because I was running my own workshop, entitled “So, you want to be a Stoic, eh? Stoicism 101.” You can download the presentation here. Finally, before the social gathering and dinners, we had our keynote speech, by best-selling author Ryan Holiday, author of The Obstacle is the Way: the Timeless Art of Turning Trials into Triumph. To begin with, Ryan and his publisher were so generous as to provide all conference attendees with a free copy of his new The Daily Stoic: 366 Meditations on Wisdom, Perseverance, and the Art of Living. He then proceeded to tell us his own story of Stoic discovery, illustrated with slides of his personal copies of the Meditations, annotated when he was 19 years old, and then again over and over as the years passed and his understanding of Stoicism deepened. Ryan exhorted us to push Stoicism into the mainstream, because so many people can benefit it from it. He is aware that some prokoptontes think that he is not “pure” or sufficiently true to the original intent, but made a compelling argument that — within limits — perfection is the enemy of the good. Spread the word, and let a thousand flowers bloom each in their own way. The steering committee for STOICON is already working hard to organize next year’s conference, so look out for the announcement of date and location, as well as a number of other initiatives related to STOICON, Stoic Week, and the Modern Stoicism movement. This entry was posted in STOICON & Stoic Week on October 18, 2016 by Massimo. Massimo and team, thank you so much for all the information you pass on to us so rapidly. For anyone, including me, who couldn’t make it to New York, it is almost as good as being at the event, but as we all know, not quite the same. On behalf of the Logotherapy community I hope you won’t mind if I mention it is Viktor Frankl and Logotherapy (not Victor and Logo-therapy). I can’t decide if the Stoic way in this case is to say nothing or to say something 🙂 I think Dr. Frankl wouldn’t have minded either way as long as people are helped and inspired by his outlook on life. Thanks again. Michel and I would have loved to have been there this year with it being held so closely to our home in Ottawa, Canada. We actually moved and where neck deep in boxes this past weekend. I am so glad to hear of how well the Stoicon went and hope to be able to attend or possibly participate in the near future. Thanks for reporting on your experiences over the weekend! Keep up the good work (fate permitting, of course). As a layperson and relative newcomer to stoicism I thought it was a fantastic event. Excellent speakers, well organized, I learned a lot. Thanks for all of the hard work. I was pleased to attend Stoicon and greatly enjoyed the presentations and the workshop. I attended Greg Sadler’s workshop on anger, and he helped me to put certain concerns I had of my own anger into perspective. My perspective also changed towards Ryan Holiday, whom I had thought was rather vacuous and douchey, but who, I think, is actually an earnest stoic presenter with the occasional flair for marketable drama, as befitting his background in the corporate world. So if Ryan is reading this… I take back those comments I made about you earlier. And I got a copy of your book from the conference and will be putting it to use from the New Year. I’m looking forward to the videos! If I knew about this I would have come all the way from Sweden. Thomas, yoy may come to Toronto next year, likely on 14 October!